Congratulations to all the new gun owners who have taken the plunge during the last several years to join us in this fascinating world of firearms and ammunition. Since you’re reading this, I’m glad to see that you’re embracing the fun of shooting and that your passion for the sport has grown. Now, that you’ve gotten a taste, G&A hopes that you’ll take your passion to another level, one that’s more technical and rewarding. It’s time to reload your own ammunition! There are two very good reasons to reload: cost and the thrill of making custom ammunition. Cost savings is obvious. If you’re shooting brass-­case ammunition, roughly 60 percent of the cost of the ammunition is in the cartridge case. By reusing the cartridge cases you pick up, you can save substantially. A quality cartridge case that’s properly resized should be capable of being reloaded at least 10 times if it is not hot-­rodded (i.e., loaded above normal pressures or propellant charge weights). Reloading allows you complete control over the end product. It allows total flexibility to choose components to arrive at the best combination for performance in your firearm. You have the entire spectrum of projectile manufacturers to choose from as well as a wide range of primers to experiment with. Perhaps, most importantly, you can experiment with a huge range of propellant speeds, types, manufacturers and charge weights. We will discuss propellants in detail in a future column but for now, let’s stay on point with getting you started in reloading. There’s an argument that could be made that it would take a while to pay for the cost of buying reloading equipment. That’s a valid point. However, if we looked at every hobby this way, we wouldn’t have any hobbies! This view would also be ignoring the personal satisfaction of loading and shooting your own ammunition. Another aspect to reloading is that it can give you the ability to bring a firearm back to life that’s chambered for an obsolete, discontinued cartridge. For instance, I am particularly fond of lever-­action rifles, especially old ones in blackpowder chamberings. I have spent many enjoyable hours figuring out how to form cases and working up loads for cartridges such as .25-­36 Marlin, .38-­56 WCF, .38-­72 WCF, .40-­60 WCF, .40-­65 WCF, etc. The ability to reload allows you to enjoy the experience of shooting early centerfire rifles and cartridges without needing a second mortgage to pay for it. With the availability of high-­quality reproduction firearms, you can rebarrel them to enjoy calibers that are not mainstream. Get a manual. Here’s our first rule of reloading: Get a reloading manual from any of the reputable bullet companies. Read it and then use it. Many shooters shy away from reloading believing that it is just too complicated and filled with risks. That’s simply not the case if you follow directions and good practice. Let’s walk through the basic process and discuss how it’s done, what is happening and what equipment is involved. Reloading is simply the process of returning a fired cartridge case to original dimensions, replacing the spent primer, recharging the case with propellant and inserting a projectile back in the case. The process is quite simple and well defined. As far as any risks are concerned, let me assure you many tens of thousands of manhours and hundreds and hundreds of thousands of dollars has been spent by projectile and propellant manufacturers to produce published reloading data. Follow the recipes and recommendations for safe and reproduceable results. Start with a kit. Moving on to the equipment and tools you’ll need and what they do. By far the best choice for a beginning reloader is to purchase a complete kit. 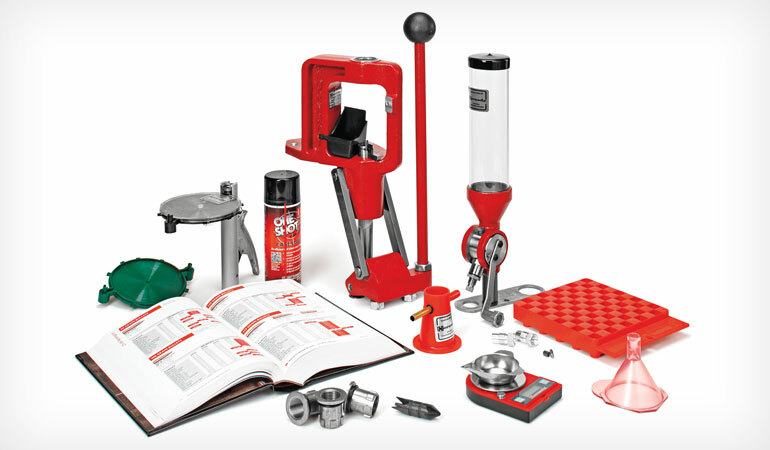 Most of the major manufacturers of reloading equipment offer a starter kit that includes the basic tools and equipment to start reloading. Hornady’s Lock-N-Load Classic Kit is just one example of such a kit. I’ll use the elements in this kit to walk you through the basic equipment that is needed and what it does. The backbone of any reloading operation is the press. The press is the piece of equipment that holds the dies and generates the force required for sizing and bullet seating operations. Basic kits are equipped with a single-­stage press. A single-­stage press will only accept one die at a time and perform one operation at a time. Before we go any further, I will offer up one strong recommendation. If you are new to reloading, whatever you want to purchase initially, consider a single-­stage reloading press. The bells and whistles can come later. Get the basics of reloading mastered first and you’ll be much happier with your new hobby. A progressive system has multiple stations and performs multiple operations with one pull of the handle. It requires setting up a lot of things at one time and can be quite tedious to get everything adjusted correctly. If you try to start with a progressive reloader, you will be wanting to use it as a boat anchor after the first couple of hours. 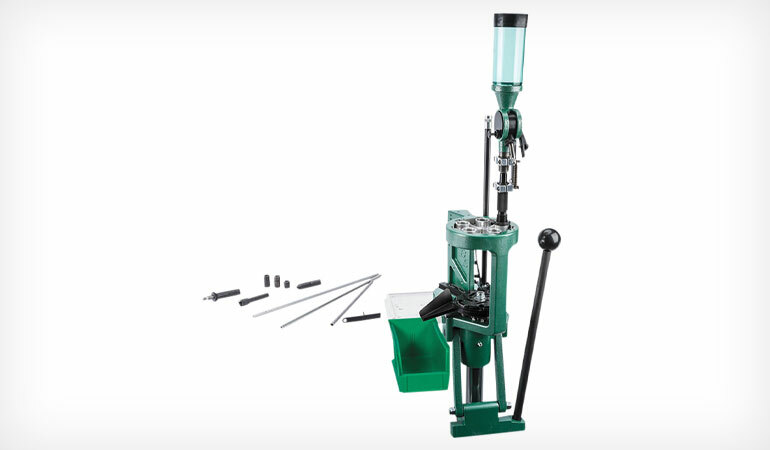 RCBS’s Pro Chucker 5 is an example of a classic progressive reloading press. Progressive systems have their place with high-­volume shooters, but are a poor choice for a beginning reloader. The next elements to be acquired are the die set and shell holder, also known as a case holder. Each specific caliber, whether rifle or pistol, has a specific die set and shell holder. The dies are the tools that screw into or are inserted into the press to perform the sizing of a fired cartridge case and seating of a new bullet. Most pistol die sets include a third die, which is used to flare the case mouth of a sized case to aid projectile seating. When a cartridge is fired, the case swells to touch the sides of the chamber and the neck enlarges to release the projectile. The fired case must be sized back down to unfired dimensions to fit in the chamber and hold a new projectile. The spent primer must be pushed out of the primer pocket. Two-­die rifle sets include a size die that returns the fired case to original dimension. The small rod protruding from the bottom of the die is the decap pin and expander that forces the spent primer out of the cartridge case and does the final sizing of the neck to hold a new projectile. Not included in most beginning reloading kits is a case trimmer. A case trimmer will be one of the first items added to your reloading operation. When a round of ammunition is fired, the case stretches a little under the very high pressure that is exerted internally on the case. The case will also stretch a little when it is resized. Because of this stretching, it will be necessary to trim the sized cartridge case back to original length after several firings. Trimming will not have to be done every time the case is fired and sized, but it will likely need to be done every three or four firings. After trimming you will need to use a chamfer deburring tool to remove the bur raised on the case mouth that results from trimming. After pressing out the old primer, you will use a primer pocket cleaning tool to remove the carbon and residue from the primer pocket. The primer pocket does not have to be cleaned after every firing, but if the primer pocket is not cleaned the carbon and residue can build up and prevent a new primer from seating deep enough. This can lead to some unsafe conditions especially in semiautomatic firearms. At this point, you insert a new primer into the sized case. This is done in the ram of the press by a small arm that pivots in and out of the ram that holds a primer. 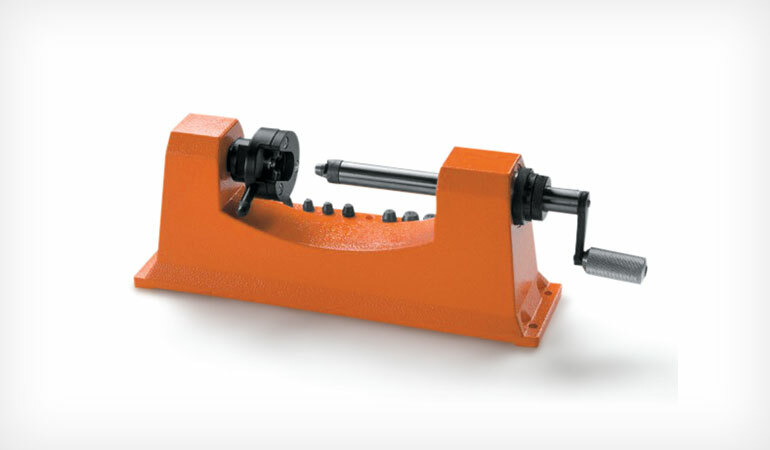 The ram is the rod in the press that goes up and down when the handle is moved and accepts the shell holder that holds the rim of the cartridge case during sizing, priming and projectile seating. The priming operation can also be done by a handheld tool. After the cartridge case has been sized, deprimed and reprimed, it is now time to recharge the case with a new charge of propellant. As far as the best type of propellant to use and how much, the best advice I can give on propellant decisions is this: Get a reloading manual. Read it and do what it says! Referring back to the reloading kit, the tall device with the plastic tube is a powder measure. It has a rotor in the middle with an adjustable plunger that allows you to set it to measure and dispense a specific weight of propellant. The plunger is actually controlling the volume of a small chamber inside the rotor that the propellant fills and then is dispensed into the cartridge case. The powder measure can make reloading a large number of rounds much faster. A scale is used to measure and precisely adjust the powder measure to the desired charge weight. The scale can also be used to precisely weigh one charge at a time and dispense it into the cartridge case with the funnel that usually comes in a kit. When weighing charges one at a time, a powder trickler is used to precisely dispense propellant into the pan of the scale. The powder trickler is usually a conical-shaped cup with a brass tube extending through it. It is filled with propellant and the brass tube is turned, which results in propellant being slowly dropped into the scale’s pan. As you can imagine, charging cases with propellant this way is rather time consuming, but it can provide some very good results when you get to the shooting bench. The last operation in reloading ammunition is the seating — or pressing — a new projectile into the neck of the cartridge case. In its fired form, a cartridge case will not hold a projectile. When you resize the fired cartridge case, the size die reforms or squeezes down the neck of the cartridge case to be several thousandths of an inch smaller than the projectile diameter (usually). 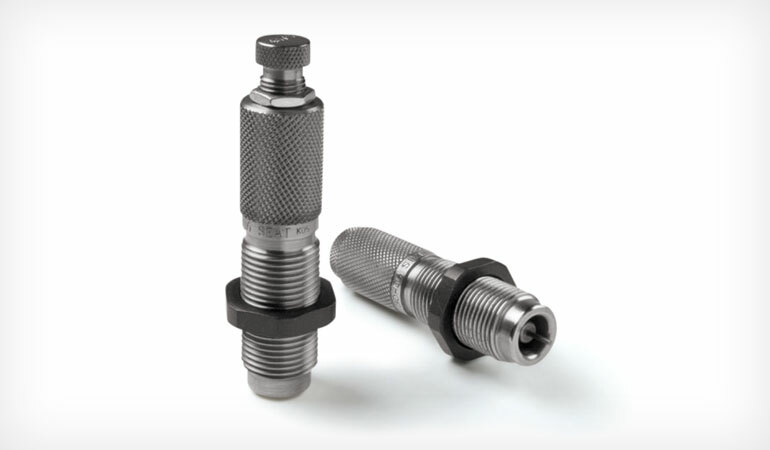 The seating die has an adjustable plunger that will force a projectile back into the neck of the cartridge case to a precise and repeatable load length. Using the process and equipment outlined above, you are able to create your own ammunition to meet your needs and desires at significant cost savings. As you become more sophisticated in your new hobby and acquire more tools for measuring and improving the uniformity of your ammunition, you will achieve performance that will not be possible any other way. To begin, get a reloading manual. Read it, do what it says and start reloading!